Rear Spoiler Market size was worth over USD 3.3 billion in 2016 and its demand is projected to cross 44 million units by 2024. Positive product outlook in the vehicles including SUVs, MPV and hatchback will primarily drive the rear spoiler market. Increasing preference of SUV coupled with boost in production capacity of the manufacturers will positively influence the product growth. In 2016, SUV sales in the U.S. was 6.9 million units with sales growth of 480,000 units. Rear spoiler offers superior performance of vehicles offering proper handling during high speed and turning. Moreover, launch of new SUV models will further fuel the business growth. Technological advancements in the automotive industry focusing on reducing overall weight of the vehicles complying the regulatory standards will propel the overall rear spoiler market growth. Usage of carbon fibers with focus on reducing overall weight and offering aerodynamics of the vehicle are the factors for the industry growth. Manufacturers focus on the aerodynamics of the vehicle using minimum design changes in vehicles. The installation of rear spoilers in automobiles reduces the aerodynamics, further supporting the industry growth. The Indian Government raised USD 11.55 million in 2015 to support the manufacturing of electric and hybrid vehicles and the budget was increased by 42% in 2017. Increasing demand for green vehicles owing to government initiative undertaken in many countries such as providing incentives and subsidies will fuel the electric vehicle production, further driving the rear spoiler market growth. Rear spoilers are used where stability and car balance are required at higher speeds. Hatchback cars are mainly used for driving in the city areas wherein the government has limited the maximum operating speed of the car. The speed limitations in the city may hamper the product penetration. Blow molding dominated the rear spoiler market share accounting over 45% in 2016. Plastic spoilers are mostly manufactured through blow molding process offering cost efficient solution owing to low-cost tooling. The technology offers desired car spoiler weight, quality, and size as per the design requirement. Injection molding will witness strong growth during the forecast timeframe. The technology allows the manufacturing of complex plastic components in various designs and shapes that would be difficult with any other plastic processing method. Moreover, it offers products at considerably affordable prices. Producers are adopting the process to manufacture plastic parts in bulk quantities. ABS plastic dominates the rear spoiler market size accounting over 40% in 2016. Increasing demand for high-performance and lightweight plastic for high efficiency and design flexibility are the prominent drivers supporting the ABS usage. Rear spoiler market from carbon fiber segment was valued at USD 700 million in 2016. Manufacturers are observing a huge demand for durable and high-quality carbon fiber components that offer functional as well as a stylish look to the cars. Industry players are increasing production capacity offering bulk production and reducing overall cost of carbon fiber. Internal combustion engine segment dominates the rear spoiler market share in 2016. The product is installed for enhanced aerodynamic properties and maintenance of the car balance at high speeds and during sharp turns. Increasing accident rates and safety concerns in the internal combustion engine segment are expected to accelerate the industry size over the study period. Hybrid segment is the fastest growing segment in the rear spoiler market with CAGR over 6% up to 2024. The huge penetration of hybrid vehicles is observed in multiple nations across the world owing to government initiatives and benefits offered by the vehicle. The hybrid vehicle penetration is estimated to increase over the forecast time span owing to the increasing fuel efficacy and speed limits. Multi-purpose technology segment will witness strong growth around 7% up to 2024. Technological advancements in MPVs are coming in line with other types of vehicles, which use lightweight parts for vehicle construction. This offers better fuel efficiency and better handling. Innovations in the cars will enhance its speed thereby requiring rear spoilers for better car balance and aerodynamic specifications. SUV dominates the rear spoiler market accounting over 65% in 2016 owing to the requirement of lightweight vehicles coupled with enhanced aerodynamic properties. These vehicles are undergoing various innovations in the rear spoiler design to achieve high performance, further escalating the industry demand till 2024. Rear spoiler demand from OEM was over 5.5 million units in 2016. The segment will witness strong growth up to 2024 owing to offering accurate product specifications as per the vehicle design. Perfect fit of the product, performance, quality, and specifications will enhance the industry size over the study period. The manufacturers are engaged in product improvement to offer better aerodynamic properties and aesthetic appeal. Aftermarket dominates the industry and will continue its dominance up to 2024 accounting over 75% of industry share. Increasing accident rates are predicted to drive the rear spoiler market size over the forecast time span. The manufacturers produce products of similar specification but differ in price, quality, and service life. In addition to this, performance and technical aspects may differ that from original equipment products. North America rear spoiler market will witness strong growth over 8% up to 2024. Rising demand for high-speed running cars has enhanced the rear spoiler demand across the region to maintain the car stability. Composite materials provide a way to shift from metals to plastic products along with reinforcement materials to meet the performance requirements and reduce the product weight. Europe rear spoiler market led by Germany, Italy, France and UK will show significant growth during the forecast timeframe. Industry players are engaged in research activities to enhance the product performance along with improving the quality of raw materials used. Stringent regulations in the region will boost the product penetration in the automobiles. In Europe, manufacturers, such as Hyundai, have adopted rear spoilers in passenger cars that are found in F1 to create downforce. Asia Pacific rear spoiler market led by China, Japan, India and South Korea demand from rear spoilers was around 13 million units in 2016. Surging passenger vehicle demand from India will increase the volume and revenue share of the region over the forecast period. 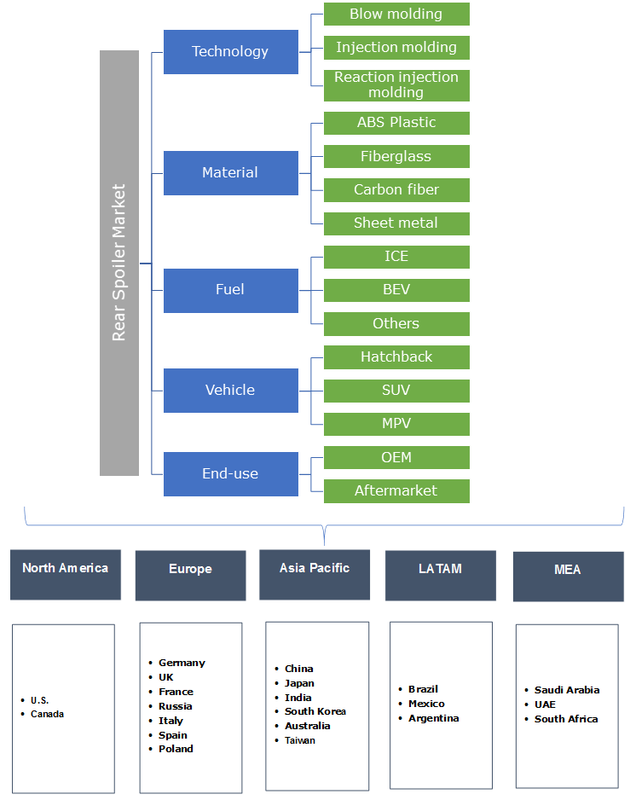 High vehicle production, demand for compact and sub-compact SUVs, rapidly growing electric vehicle market, high penetration of automotive aftermarket, and increasing e-commerce in the auto parts industry will boost the product demand over the forecast timeframe. Some of the key manufacturers contributing the rear spoiler market share includes, Albar Industries, Inc., Mercedes-AMG GmbH, Changzhou Huawei and DAR Spoilers. Few other notable players include Magna International, Inc., Mitsubishi, Plastic Omnium and Polytec Group. New product development is among the major strategies implemented by the manufacturers to enhance their visibility in the industry. For instance, in August 2011, Mitsubishi launched limited edition of SUV Outlander with upgraded features in its rear spoilers. Acquisitions is witnessed as another strategy adopted by the industry participants. For instance, in July 2016, Plastic Omnium completed the acquisition of automotive exterior business of Faurecia SA. This acquisition induced immense growth potential to the company. Manufacturers are also focusing on increasing their production capacities, resulting in heavy investments. For instance, in August 2015, SMP Automotive Systems invested over USD 150 million to establish a manufacturing facility near Tuscaloosa and supply to Mercedes Benz plant located nearby Vance. Changing economies, accelerating technologies in automobiles, and shifting consumer preferences are the key factors with increased sales of vehicles. 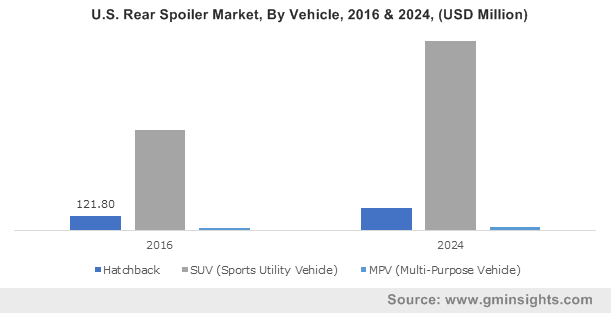 Increasing digitalization in the vehicles along with boosting the efficiency of the vehicles are the prime factors for the rear spoiler market growth. Long-range electric vehicles are equipped with rear spoilers to enhance the aerodynamic effect on the highways. Moreover, hybrid electric vehicles are incorporated with improved technology such as electric motor drive, regenerative brakes, and automatic start/shut off. The rear spoiler supports in improving vehicle efficiency as it saves energy by enhancing the design of the zero-emission vehicles. Increasing penetration of electric vehicles across the globe will pave in opportunities for the industry players to generate a higher revenue over the next decade. Reducing the overall manufacturing cost and offering products at reduced cost are the prime factors defining the business growth. Moreover, the product should be lightweight, easy to manufacture, and offers superior operation when there is a temperature difference. Fiberglass is widely used for manufacturing rear spoilers owing to effects such as no deformation during temperature change and higher adherence of paint to the surface during manufacturing.